Every so often, I forget why I stopped eating refined sugar. I forget how it makes me anxious, changes my mood and makes my heart skip a beat (literally – I get heart palpitations from the stuff). I lose track of all that and wonder… why am I passing up that ice cream / cookie / fill in the blank with any sugary treat. I dive in. I indulge. And then, I regret. With the consequences fresh in my mind, I remember why I’ve been avoiding the stuff for years. Yes, years. You’d think, after years of avoiding it, the reasons would stick and I wouldn’t need these occasional reminders, but I find myself in this position every few months. It’s as if the lack of daily reminders pushes it in to the back of my mind. The temptation grows until I can’t remember exactly why I am depriving myself of these delicious treats. It’s the same way with wheat. Although the consequences are more severe and immediate, I occasionally think, “Oh, I can have just this one pastry…”, and then I remember why. Perhaps it’s because I only gave up wheat a year ago; perhaps it hasn’t been long enough for me to fall in to the ‘Why am I doing this, again?’ trap. I even dream about eating wheat – realizing the error of my ways only when it’s too late. I wake up panicked, then relief sets in, knowing it was only a dream. Back to sugar – my relapse came in the form of toasted marshmallows and s’mores this weekend. We decided to test our new camp gear and do a little backyard camping. We set up the tent, inflated our mats and unrolled our sleeping bags. Then, we told stories and roasted marshmallows while sitting around our firepit. It wasn’t my intention to eat marshmallows – it just happened. 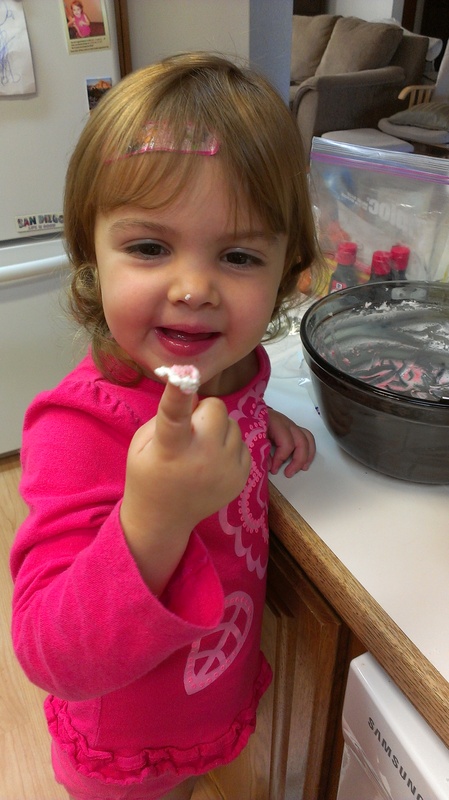 We’d toasted too many, C had her share already, and I rationalized that one marshmallow couldn’t be that bad. The first became a s’more, then I toasted another marshmallow, and I think possibly a third. Paired with a few glasses of wine, sugar levels were skyrocketing. The thing is, I can get away with natural sugars and do fine. I have yet to overdose on honey or maple syrup – it’s really only the highly refined stuff that gives me these symptoms. I guess it’s only right; our bodies probably have an easier time processing these types of natural sugars. Alas, marshmallows made with these natural sugars aren’t easily found at the store. Looks like someone else had the same idea. :-) Time to get cooking, I guess! Ever notice how the professional world zaps your creativity? I’m sure it varies, depending on how much your job uses your creative brain, but for most office work, that part of your brain seems dampened. I would have argued against that statement previously – I always thought that I maintained a reasonable balance between work and creativity. That was before I had a true break from the professional world, though. I always knew that I had a difficult time blogging when work was at it’s peak. I usually chalked it up to lack of time and the normal writers block that occurs from time to time. I would just hit a wall – nothing coming out. Having the switch from working to being a stay at home and back again gave me a rare perspective I would have missed otherwise. The more time I spent at home, the more rusty my analytical left brain became, and the more my creative right brain blossomed. You can see the trend in my blog – not only based on the number of posts I was churning out previously, but in the content as well. I had the time and desire to create new things, and dabbled in everything from sewing to cooking. I even came up with a few new ideas, like my mason jar lids! As I’ve moved back in to left brain territory, I find my creativity dwindling. The ideas that sparked strongly before have diminished to a soft glow of ember – still there, but needing more time and attention to return fully. So, the question becomes, are we born predisposed to the right brain or left brain, or do we gravitate toward one or the other as those flames are stoked? If I had focused more on art as a kid, would I still have become an accountant? Or did I gravitate toward math and accounting because I was hard wired to do so? Did I move away from the arts and in to analytics because of nature or nurture? We know that out dominant hand generally indicates whether we are right or left brain thinkers, and that no one is 100% either side, but there seem to be many exceptions to the dominant hand rule. Left handed accountants and right handed artists do exist in our world – I’m sure in some abundance. Did someone help foster one side of the brain over the other, or were these predetermined at birth? So, which do you think it is? Perhaps both? I miss the days of pre-Amazon, pre-smart phone shopping. Before we were saturated with information. Before we scanned every product with our phone. When we could pick something up just because it looked cool, rather than buying it because we’d scoured reviews, weighed all options and finally purchased from the most reasonably priced quality seller we could find. I get anxious when making a purchase decision now. Is this the best price? Is it a high quality product? Could I do better? The opportunity cost of each purchase grows proportionally to the depth of data at our fingertips. For me, it means I often delay buying – sometimes to my detriment. It’s not just products either. Services are the same. Yelp has created a plethora of service data – which, while informative, are all subjective and dependent upon the mood of the customer and the provider on a given day. Take my search for a lasik doctor, for example. Pre yelp days, I would have asked around, gotten a few personal recommendations, met with a few doctors, then jumped in. Now, though? It’s a different story. I gathered opinions from friends (which still holds the heaviest weight in my mind). I read about Billy	Bob’s negative experience, and I file that in my head. Then I read Sally’s glowing review, and I file that away, too. Repeat. Soon, the good and the bad start the blend, and the individual reviews get a bit blurry. Here I am, a month in to the process and I haven’t been able to decide on who I should see. There are just too many options, and all have pros and cons. For me, delaying decisions often leads to paying more in the end – and the hit stings financially and emotionally. Knowing that if I had just decided sooner, I could have saved some money just kills me. Most recently, I delayed pulling the trigger on a hotel for a trip this fall. I created a spreadsheet, compared options, weighed objective and subjective data, but just couldn’t come up with a decision. I was a click away from booking one hotel, but when I found several negative reviews I hadn’t seen before, and it stopped me in my tracks. In the end, I booked that same hotel a few weeks later, but paid $30 more per night because of the delay. Here’s my dilemma – it’s expected that you’ll research things before making a purchase, choosing a doctor or booking a hotel. It’s a world of buyer beware, where the it’s on you to check things out before you commit. There’s no (or very few) times when you can shrug and say, “There’s no way I could have known.” That responsibility weighs on me when making these decisions. It’s taken something as simple as buying toilet paper, and turned it in to a statistical analysis – giving weight to all factors and trying to find the best option. It’s making life more complex than it used to be. The number of options we have today is also wonderfully problematic. I watched a TED talk on choices a few months ago. It discussed how having more options can actually diminish our purchase satisfaction. So, while it’s great to have a few options, once it goes past 5 or 6, we start to feel less satisfied with our decision. I think it’s due in part to the opportunity cost that comes from the items we didn’t choose – and in part because making that decision took so much dang time. It’s just doesn’t feel worth it. The small cost savings or incremental quality increase isn’t worth the time and energy we put in to the decision itself. Multiply that process time by a whole shopping list, and you leave the grocery store feeling rather depressed. There’s a surprising genius behind grocery stores like Trader Joe’s. They have one or two options for most of their fresh and frozen products – organic or not. The dried goods isle gives you a bit more variety, with five or six types of sauces and various types of pasta. The dairy case has a wide range of options, but still keeps the options slimmed down to around four options for each type of item. The number of options feel manageable – easy, even. Either you like what they’re selling, or you don’t. They don’t offer 18 different options for chocolate ice cream – there’s one, maybe two. (The wine section blows away my point, but it still doesn’t feel as intimidating as the larger grocery stores.) I leave Trader Joe’s feeling satisfied with my purchases. As with so much else in life, once again, less is more. It seems there’s never enough time. We inevitably find ourselves saying goodbye to loved ones before we’re ready. It’s not as if when a loved one dies, we say “gosh, we spent just the right amount of time with them”. It doesn’t matter if you spent minutes, hours or days with them in their final time, it’s never, ever enough. The world has been full of sadness lately, and I do not find myself unaffected. I cried when learning about the school shootings last week. I welled up when I learned that my neighbor passed away a short three days later. Another three days, and my grandma passed away unexpectedly. Understandably, the most recent loss is the most painful for me. I take comfort in the fact that she lived a long, full life. She leaves behind of legacy of kindness, love, caring and compassion. I admired her strength, perseverance and, yes, even her stubbornness. She tried so hard to help those in need, even when it meant she had to make sacrifices for herself. She took in family, friends and kids alike – anyone who came to her for help, even if it was just for advice. In many ways, we were very much alike, which could lead to us locking horns. We had conversations that turned in to a lively discussion. Regardless, we would always come full circle, moving past whatever topic we were discussing to end on a common ground, often agreeing to disagree. My grandma was a very proud woman, which usually meant it was a losing battle to argue with her. She held her ground tightly, but was open to hearing and discussing other ideas. Those talks helped both of us see a slightly different point of view. Despite her strength during discussions, her humility shone through when she decided that she was, in fact, wrong. She wasn’t afraid to apologize when she’d hurt someone. Sometimes, we’d come back to a topic a few days after the initial discussion to find resolution and clear the air. Today, we made it through a strange christmas day. My mom was gone, helping with funeral arrangements, and my brother and dad joined our family for christmas eve and day. (We missed you, Mom!) Now, with the holiday over, my grandma’s funeral is quickly approaching. As we move closer, I find myself struggling with the idea of letting go – of really saying goodbye. Despite her long and full life, my selfish side argues that she should have a few more years. It saddens me that my daughter will never truly know what a wonderful woman she was. It was easier to distract myself from the reality of it all when I was in the hustle and bustle of the season, but now, I’m facing this dead on. And I’m just not ready. She just shouldn’t be gone yet. I don’t want to say goodbye. I feel lucky to have had such a wonderful grandma in my life. Although we haven’t lived in close proximity during the past twelve years, the memories from when she did live near us have stayed with me. Even though we lived far apart recently, she was there when I graduated from college, was a part of our wedding and has met our daughter several times. I’m glad that I had a recent conversation with her. It was a few weeks ago, when we called to thank her for one of C’s birthday presents. I put the call on speaker phone so C could talk to her and thank her for the present herself. It was a good talk, but like all things in life, felt too short. We talked about her coming out for a visit in the spring, or us going out to see her if she wasn’t able to travel. We made it out to visit last fall, and, thankfully, Grandma came out our way to visit frequently. Even in her eighties, my grandma still had a very sharp mind. Her body had begun to fail her, though – carrying around extra weight puts such a strain on the body and heart. The last time we spoke, she told me that her back was hurting badly and that she was having trouble getting around. She seemed discouraged that her body wouldn’t do what she wanted it to anymore. She was determined to make it to 86 years old this spring, however, she also feared putting a burden on others as her body deteriorated. She was adamant that she would not force her children to take care of her, and had entertained the idea of moving to a care facility. We’d talked about recording grandma telling the crazy stories from when her kids were younger, helping her write memoirs, or even writing down some of her favorite recipes to pass down in our family. I don’t think we ever did any of those things. I wish we’d gone out to visit more often. I wish I’d called more. I wish C could have had a few more years with grandma, so she would remember her. All the wishing in the world won’t change things now, though. It seems we never, ever have enough time, so we should make the most of it. I’ll miss you terribly, Grandma. I’m sorry to have to say goodbye. For a short while, I owned a VitaMix. The first day, I was in love. I watched the instructional video, excited to try new creations. My first try in the VitaMix was humus. A simple recipe with great results. Smooth, creamy and delicious. I continued on to make soups, nut butters and dips with varying success. The machine had incredible power – almost too much at times. Green monster smoothies were amazingly smooth. My almond butter turned out grainy – never reaching the smooth consistency that I saw on so many YouTube videos. The butternut squash soup we blended up turned out delicious. My roasted red pepper sauce was mind blowing. My attempt at cashew cheese was disastrous – the VitaMix was a bit too powerful for the mix, as it heated up the cashews too much and killed the probiotics that were critical to the recipe. The banana ice cream changed my life. Like I said, varying results. About a week in to owning this powerful piece of equipment, I started to notice a leak from underneath the pitcher. It was small at first, just a few drops in the base of the machine. A few weeks later, it had gotten worse. Now, I was getting about half a teaspoon of liquid at the base, but really only when I mixed a thin liquid or water and soap to clean it. The problem continued to worsen over the coming weeks. I purchased my VitaMix on August 2nd. I emailed customer service about the leaks on August 27th. I received a reply on September 11th – two weeks later. For a company that is supposed to be renowned for its customer service, this delay seemed excessive. They asked if my blender was still leaking and if I had access to a color printer to print a return shipping label. I was dealing with the death of a family friend, my reply took a few weeks – I wrote them back on September 24th, to confirm the leak was still there and that I did have a color printer, but I never heard back. After a month of waiting, I called the customer service hotline. 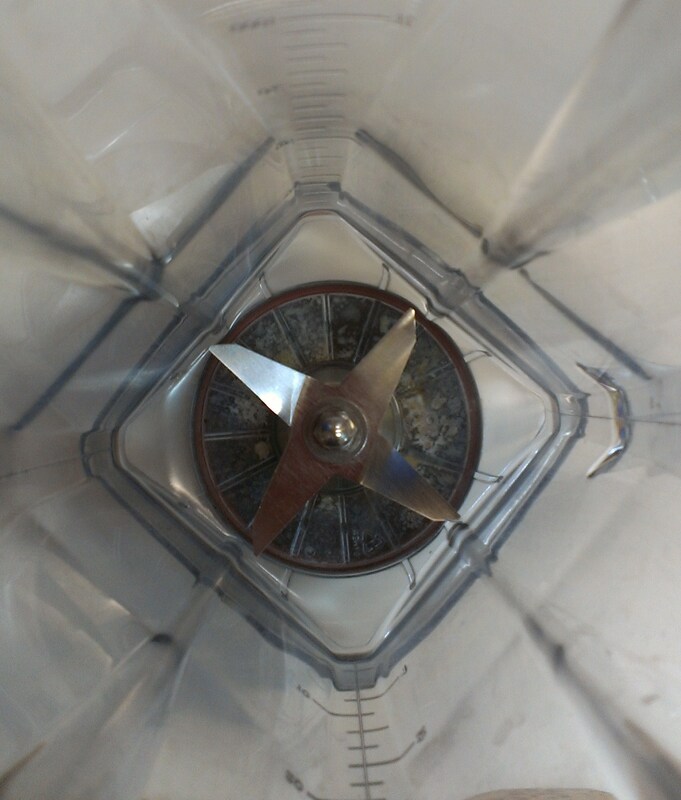 By now, a mold had started growing in the base of my pitcher, between the clear plastic at the bottom and the blade unit underneath – where I could not reach to clean. The customer service rep said the leak was most likely due to a bad seal and that he could rush out a new blade and wrench to change it out. However, by this time the mold that had started to grow was really grossing me out. Considering that mold spores can embed in plastic and never be thoroughly cleaned, I was past the point of being ok with just switching the blade. If I’d had access to this area to clean it sooner, or had received a timely reply to my customer service request, this wouldn’t have been an issue. I told him so and asked if they could just replace the pitcher instead. He was unable to do this for me (even though that’s what the original email from their customer service rep suggested they do) and that they would call me back once they discussed it with a manager. Come Monday morning, I got a call back. The new pitcher had been approved, however, I would need to wait for them to mail me a return label, then I was to box up the pitcher and find a FedEx location to ship it back from. Once that was complete, I was to call them with the tracking number so they could send out a new pitcher. It seemed like so many steps, plus several days without a functional blender. I was a little bewildered as to why they couldn’t just send me the new pitcher, with the return shipping label, then let me send back the old one in the same box. When I asked about whether this was an option, they balked about it, stating, “That’s a $150 pitcher!” Yes… and even though I spent $400 on your blender, the pitcher I have is BROKEN. It was insulting. They seemed to imply that I would steal it. I told them to forget it – I’d just take the pitcher back to Costco, somewhere that has consistently fantastic customer service. It would be easier than jumping through all of the hoops VitaMix was requiring, and, honestly, at this point I was fed up with the company. So, after a short three months of owning a VitaMix, I’ve taken the blender back to Costco. For now, I’m back to my Magic Bullet. While it’s not as powerful as the VitaMix, it also doesn’t come with the hefty price tag, so I don’t expect as much out of it. The VitaMix did some awesome things, but I’m making do with the Magic Bullet. For now, I’m not missing the VitaMix. I’m not sure that I’ll purchase another one. Maybe I’ll look in to the Blendtec instead. We’re doing a gluten free re-mix this year, using Udi’s bread. I’ll let you know how it turns out. Step 1: Brown / Crumble the sausage in a frying pan. While doing this, the recipe also calls for melting an entire stick of butter into the mix. Really. No joke. Absolutely no fat is wasted in this stuffing. This dish is going to help us bulk up for the winter and possibly give us a nice cardiac episode for the holidays. Step 2: In a 13″x9″ baking pan, mix the bread cubes, apples cubes, and chopped onion. Then add the sausage and melted butter to the mix. Mix it all up so the bread absorbs the melted butter and pork fat. Step 3: Add the rubbed sage and mix in. There is no real set amount of sage that you should add, instead just add this until you feel that it’s fragrant enough to be tasty in your mouth, but not overpowering. Step 4: Put the entire baking pan in the fridge and let marinate for two (2) hours. Not sure why this is necessary, but hey, I won’t argue with perfection. Step 5: Bake in the oven at 350F degrees for 1.5 hours or until crusty and brown on top. Step 6: Shovel into mouth. Nap. Shovel into mouth. Submit to butter induced coma. Repeat. Ben & I recently discovered smashed potatoes. Yum! Crispy, flavorful and delicious. The perfect side dish for your holiday turkey. I use the microwave to shortcut this recipe – throw your potatoes in a big bowl, add 1/2 c. water to the bottom of the bowl, cover the entire dish with a damp paper towel. Microwave using your “potato” button (3 baby potatoes equals approximately 1 large potato). If you don’t have a “potato” button, try approx 3-4 minutes per potato (1 large = 4-6 min, 2 large = 6-8 min, 3 large = 9-11 min). Microwaves vary, so test your using less time, then add more as needed until potatoes are cooked through and begin to soften. You can also boil the potatoes to pre-cook them, if you prefer. Prep a large casserole dish by drizzling olive oil on the bottom. Once the potatoes are cooked, put them in the oiled dish. Use a potato masher or the bottom of a glass to “smash” your potatoes. You want to break the skin and flatten the potatoes like a cookie. More surface area means more crispy, crunchy, deliciousness. Drizzle more olive oil over the smashed potatoes, then add salt, pepper and rosemary (or other herbs) as desired. Heat the oven to 450°F. Roast the potatoes for 30-40 minutes, until they’re crispy and brown around the edges. Serve hot. With C’s 3rd birthday quickly approaching, I have been keeping an eye out for gluten free cake options (I think I’ve mentioned that she’s gluten sensitive as well). Luckily, corporate america has not left me wanting. 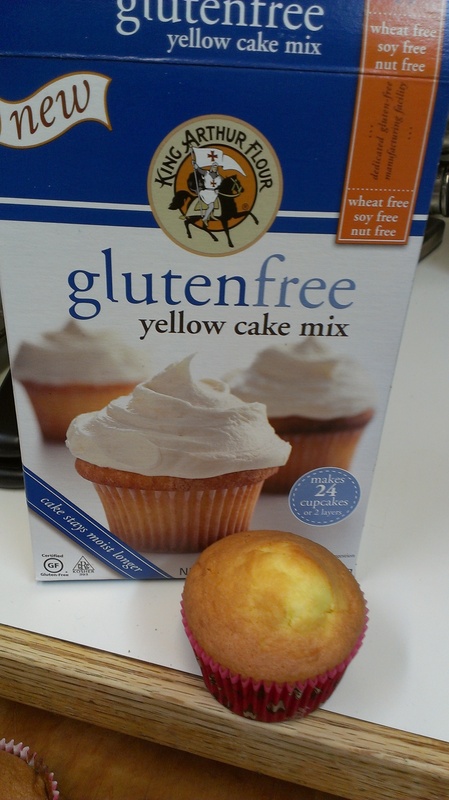 Main stream brands have been coming up with their own gluten free mixes to rival the little guys. 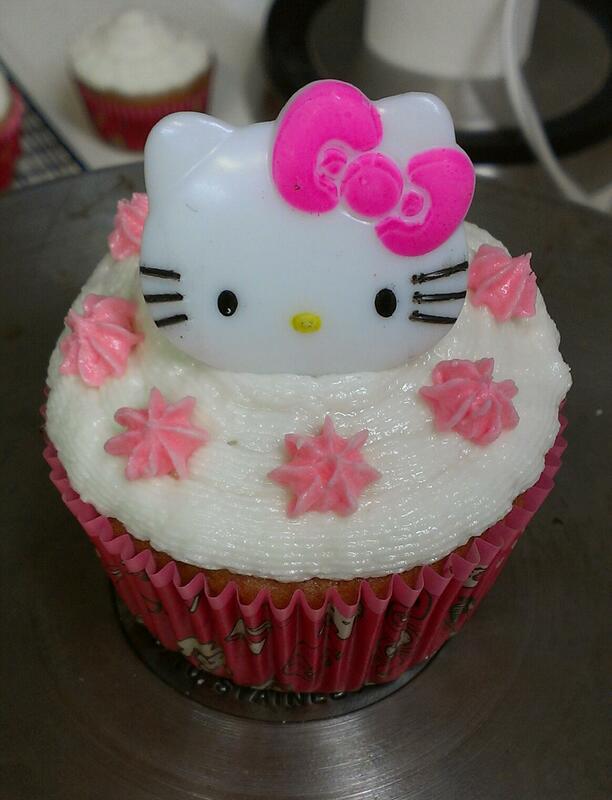 A few weeks ago, I tried Betty Crocker’s chocolate gluten free cake mix and made some cupcakes. And, while they very much resembled cupcakes, I wasn’t blown away by the taste or texture, and wouldn’t waste my calories on it. They were a bit gummy and chewy for my tastes. I could definitely tell that rice flour was a main ingredient. C mainly ate the frosting off the top of those. 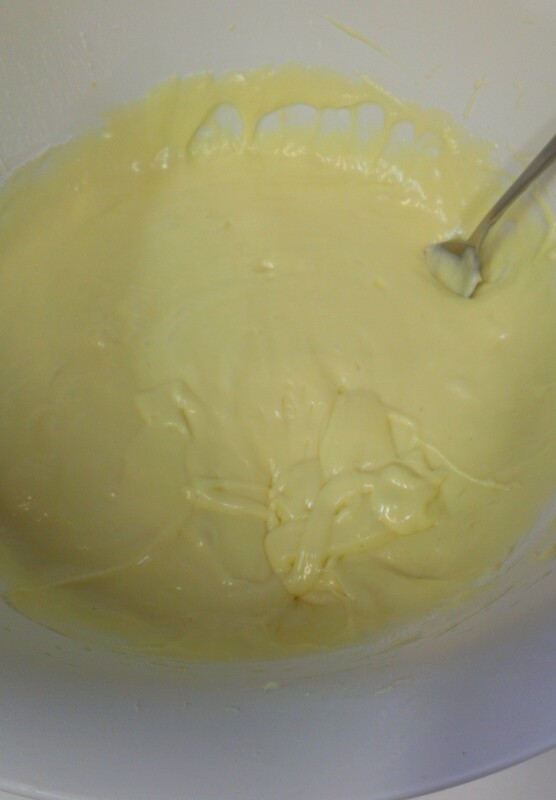 My mom tried Betty’s vanilla cake mix with better results – C actually ate some of the cake as well with those. Today, the day before C’s party, I decided to give King Arthur’s brand a try. I’ve never used their wheat based products, so I didn’t have a frame of reference for comparison for gluten-y products. I saw it on the grocery store shelf and passed it over at first glance. It was 50% more expensive than Betty’s box. However, at second glance, I saw that the weight and yield are twice that of Betty’s. For example, I got 12 meager cupcakes from Betty’s box, where as King Arthur produced 24 robust cupcakes. I probably could have easily stretched it to 30 cupcakes. So King Arthur was a better value (Betty Crocker ~$5 for 12 cupcakes, King Arthur’s ~$8 for 24-30 cupcakes). 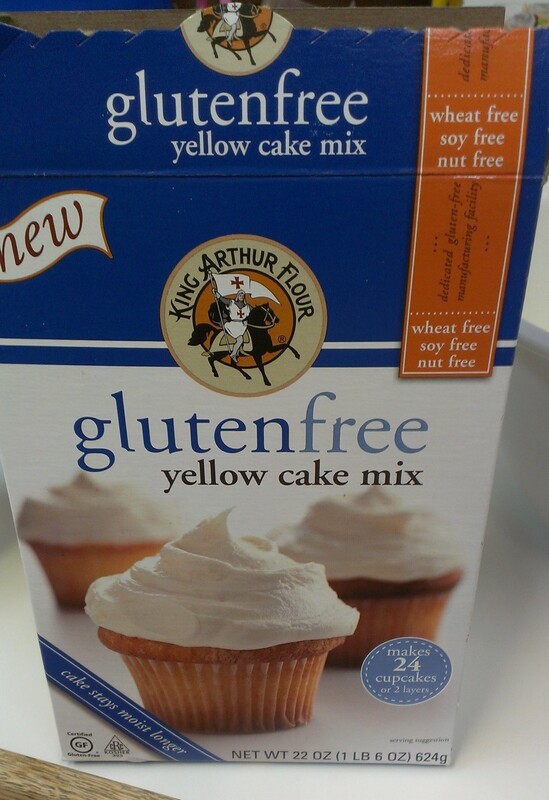 Needing cupcakes for the birthday celebration tomorrow, I pulled out the box of King Arthur’s gluten free yellow cake mix. The first thing I noticed while preparing this mix was that the instructions are detailed and very specific. I think the calculated method of preparation helped the batter turn out less runny than Betty’s did. This batter held up really well and was actually quite thick! While spooning it in to cupcake papers, the batter retained its shape, lumps and all. As I mentioned previously, I got 24 of these bad boys out of the box. Great value! These smelled delicious while baking and browned really nicely! The batter actually held its shape far better than I expected – making me wish I had tapped the pans a bit before putting them in the oven. The cupcakes rose where the lumpy spots from spooning the batter were, leaving some uneven mounds. 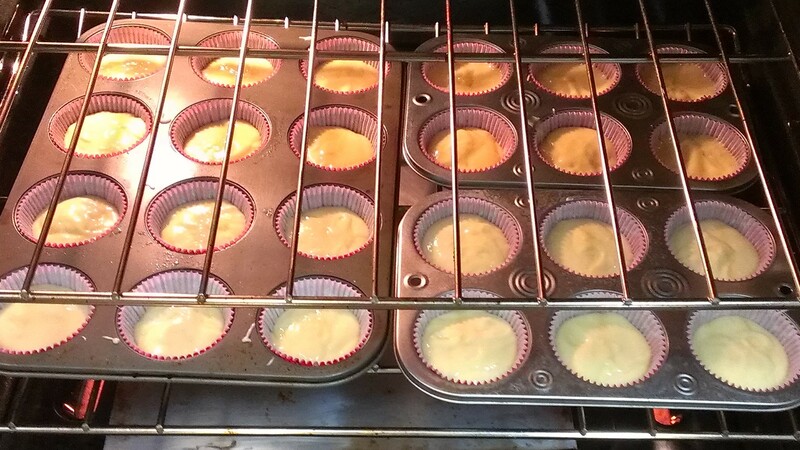 They rose quite a bit – filling the cupcake papers half way would have given me perfect cupcakes. We taste-tested one for the sake of our guests (oh, the sacrifices we make). Overall, the baking results were great. 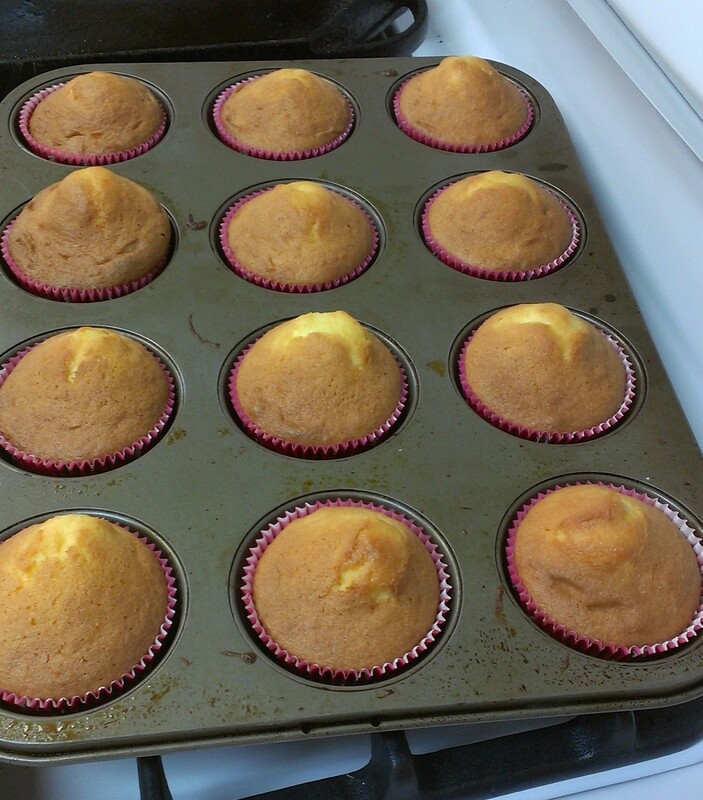 The cupcakes turned out light, fluffy and moist. They were also very tasty! Ben, C & I polished one off, then C asked for another! Considering there was no frosting on them yet, I’d call it a success. And I’m sold! King Arthur, you did a great job on this product. Here’s the finished product, frosting and all. In the end, it actually worked out well that the tops were uneven. I used them to strategically place the Hello Kitty rings. Note: I was in no way influenced by the company to promote this product. Although I would have loved a sample product to review, this one I paid for myself – and I would do it again! I have yet to complete my gluten test, mainly because I’m a bit scared of the ramifications that may accompany reintroduction. After the few snapshots I got from my last small test, I’m a bit wary to try it again. And, yet, for the sake of science, and for that questioning mind of mine, I still plan to give it a go. I don’t think I ever really gave my thoughts on the 21 Day Sugar Detox, so here’s my high level recap. I definitely wasn’t expecting that it would result in removing gluten from my diet. It’s a PAIN! It is in absolutely everything! Part of me wishes I could go back and not do the 21 day sugar detox… but I know that if I really am gluten sensitive, this could be the cause behind some of the other issues I’ve been dealing with over the past few years. Issues that medical professionals have scratched their heads at and thrown numerous pharmaceuticals at without reprieve. Even my holistic medical advisers have been at a bit of a loss to determine the root cause. But the symptoms seem to line up with gluten sensitivity or celiac disease. So, even though the results of the detox weren’t exactly positive for me, they were very insightful. And, for that, I’d gladly hand over $21 again. Her death haunts me. More accurately, her life haunts me. She finds her way in to my dreams, displaced in her surroundings. She knows she shouldn’t be there, and yet, her presence defies logic. In my dreams, small details come back to me. The smell of her perfume, the hair spray she used, the scar on her arm. Those little gems that are hidden away in my subconscious; not readily available to my waking mind. Last night, she sat next to me at a table with all of our family at her own funeral. I cried hard, knowing I had to let her go. She just stared at me, not saying much. Her sister and parents sat at the end of the table, Ben sat to my right, she at my left. I heard her sister and father talking – uncertain whether to comfort me and wipe away my tears. They ultimately decided that this was something I had to go through on my own and let me be. She was there, but not fully connected to us. Her makeup was caked on, perhaps reminiscent of the makeup I saw when she lay in her casket. I noticed the details – things my mind had long forgotten. When I spoke to Ben about her, we referred to her in the third person, as if she were a mannequin. I felt her scar, her hand, her arm. Everything felt so real. My dream felt so real that I was certain I was awake, and yet, in it, we talked about how I could only remember these types of details in my dream. I walked outside the building and stare at the cemetery where she was buried. I slump down against the rough beige plaster. I see the headstones some distance away, and know that she is gone. The dream morphs from here, turning familiar surroundings in to new ones and embarking on a new story line. I woke up sad. Sad for the things that happened in the dream, sad that my time with her was over, yet again, sad that it wasn’t real. The small moments of time I get to spend with her in my dreams are enough to keep her present in my life, even though it’s been 11 years since her death. Birthdays and holidays are hard – those were the times I could always count on seeing her at family events. My recent birthday probably put her at the front of my mind. The fact that she was only 30 reminds me of my mortality. It frightens me that we can be gone so quickly. It reminds me of how fragile we are, and that, despite what our plans may be, life does not continue in this form indefinitely. The fact that she was a mom hits even closer to home now. Knowing how hard she must have fought to hold on for her son’s sake. Her child never having the chance to really know his mom. I know C would do fine without me, but the thought of leaving her before she is grown is crushing. Perhaps her visits in my dreams are some form of communication from another plane of existence… or perhaps it’s just my brain trying to wrap itself around the enigma of it all.